Causa is a wonderful Peruvian dish that basically amounts to a fish, seafood, or vegetable salad sandwiched between two layers of mashed potatoes seasoned with Peruvian aji chilies. Causa has become a symbol of the creativity inherent in modern Peruvian cuisine, with chefs and home cooks alike making their own unique versions that follow the basic format. Typically, Peruvian yellow and white potatoes are used in a causa, but to celebrate the fall and practice some creativity of our own, we used delicious sweet potatoes from Johnson’s Backyard Garden (along with several of their other seasonal veggie offerings) to make this version. Boil the potatoes with the skin on until very soft, about 30 minutes. When cool to the touch, peel with your fingers then mash in a large bowl. Add aji amarillo and the juice of two key limes to the mashed potatoes and season with salt to taste. Set the potato mixture aside. In another bowl, mash the chickpeas. Add onions, parsley, roasted peppers, vegan mayonnaise, and the juice of the other two key limes. Season with salt to taste. 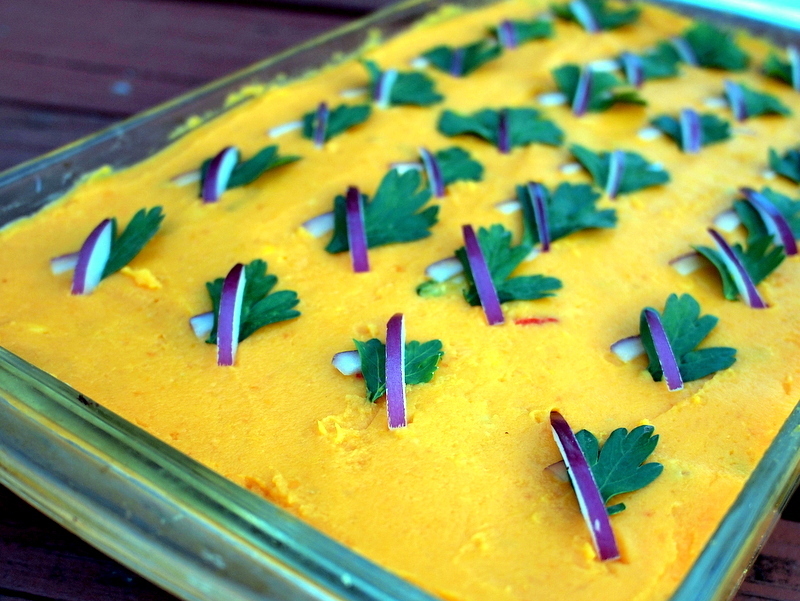 Assemble the causa in a large casserole dish. Make an even layer of the potato mixture on the bottom of the dish then make a layer using all of the chickpea salad. Finish with a top layer of the potato mixture. Decorate as desired. Serve at room temperature or slightly chilled.